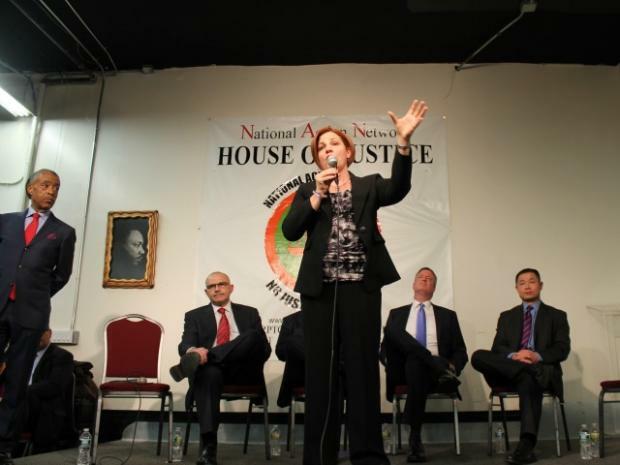 HARLEM — City Council Speaker Christine Quinn received a chorus of boos in Harlem Tuesday night, when she suggested Police Commissioner Ray Kelly should stay on as mayor. “I have no jobs to offer to him or to anybody else!” she cautioned, but repeated her position that whoever wins would be lucky to have Kelly stay on as the city's top cop. The suggestion was met with loud boos from the crowd gathered at the House of Justice for a debate with Democratic mayoral candidates hosted by Rev. Al Sharpton on Martin Luther King Jr.'s birthday. Sharpton's Martin Luther King Jr. forum, which is usually one of the biggest events on the political calendar, was pushed up because of Monday's presidential inauguration. Quinn quickly cut through the boos. "Wait a minute! Wait a minute," she said. "Let me be clear: If I'm mayor, the police commissioner will work for me." Quinn said that while she respects the commissioner, she doesn't agree with him on every issue, including stop-and-frisk. "There is no question that when you have 700,000 stops or more that are almost all concentrated, targeted on men of color that have yielded an insignificant number of guns, your program is off-track," she said. Former City Comptroller Bill Thompson, who received the most enthusiastic response from the crowd, took a harsher tone with Kelly, saying it was time for a change. Under a Thompson administration, he vowed, "the current police commissioner will not be retained." Both Thompson and Public Advocate Bill de Blasio said it was time for new leadership and said stop-and-frisk was a useful tool that is being misused. Only City Comptroller John Liu said the practice should abolished outright. “It's making everybody less safe,” Liu said. The candidates were asked to weigh in on their biggest disagreements with the current mayor, who is typically thought of as a close ally to Quinn. Thompson said the mayor had failed on education, while de Blasio and former Brooklyn City Councilman Sal Albanese criticized him for seeking a third term. Liu slammed him for the lack of diversity at City Hall. Quinn, whom many expect to receive Mayor Michael Bloomberg's endorsement, faulted his attempts to veto living and prevailing wage bills, and his decision to begin a "Giuliani-era" homeless policy that's now being battled in court. After the forum, Sharpton said he was impressed by the way Quinn handled the crowd. “I was impressed that Ms. Quinn did not duck the Ray Kelly question,” he said. “Clearly [members of the audience] were not pleased, but I think she made a tremendous comeback on other things." Bloomberg, who spoke to the group about guns ahead of the debate, received a warm reception after being booed last year.